An uninterruptible power supply, also uninterruptible power source, UPS or battery/flywheel backup, is an electrical apparatus that provides emergency power to a load when the input power source ormains power fails. 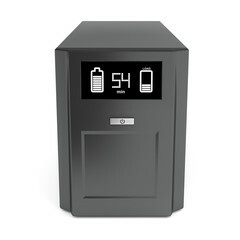 A UPS differs from an auxiliary emergency power system or stand-by generator in that it will provide near-instantaneous protection from input power interruptions, by supplying energy stored in batteries, super capacitors, or flywheels. The on-battery runtime of most uninterruptible power sources is relatively short (only a few minutes) but sufficient to start a standby power source or properly shut down the protected equipment. A UPS is typically used to protect hardware such as computers, data center, telecommunication equipment or other electrical equipment where an unexpected power disruption could cause injuries, fatalities, serious business disruption or data loss. UPS units range in size from units designed to protect a single computer without a video monitor to large units powering entire data centers or buildings. Businesses today need to invest money in their information technology (IT) infrastructure, as well as the power required to keep it functioning. They count on this investment to keep them productive and competitive. Leavingyour (IT) infrastructure defenseless against electrical dips, spikes and interruptions, is a bad idea. Contact Electrical Duties, we can help you hook-up your UPS. If we can’t help, we’ll gladly point you in the right direction or refer you to someone who can.